Make your favourite white lingerie radiate in a seductive white again. 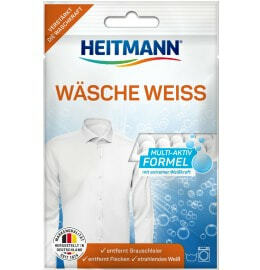 HEITMANN Lingerie White removes greyness and yellowing from synthetic fibres. Ideally suited for bras, tops, slips, and microfibre shirts. Greyish instead of seductive? Many white undergarments turn grey or yellow over time. Normal detergents and whiteners do not solve this problem, as they are not effective on synthetic fibres. Rescue your delicate laundry with HEITMANN Lingerie White. Its patented formula was specially developed for synthetic fibres, which are used for delicate white undergarments as well as many tops and shirts. HEITMANN Lingerie White removes greyness and yellowing even from the most delicate fibres. Your lingerie shine in pure white again. Bras, slips, tops, and microfibre shirts look like new. Simply wonderful: with HEITMANN Lingerie White, you can make your delicate laundry radiate brilliantly white again. Greying and yellowing are easily eliminated. Fill a bucket with three litres of lukewarm water. Dissolve sachet contents while stirring. Completely immerse up to 400 grams of laundry in the solution. Now put the included bag over the top of the bucket and fill with water. This ensures an air seal, which is crucial for this process. Let the laundry soak for at least 24 hours. The laundry will be even brighter if you leave it in the bleach solution for three days. Finally, wash the laundry as usual to remove any loose residual dirt. Only use HEITMANN Lingerie White for pure white textiles. Do not use on stains from self-tanning products or sun cream. The bleaching performance decreases with an increasing quantity of textiles or water. 15 – 30% Natriumhydrosulfit, Duft- stoffe, weitere Inhaltsstoffe: Soda, Polymere Wirkstoffe. Nicht mischen mit chlor- oder percarbonathaltigen Mitteln. Achtung Verursacht schwere Augenreizung. Ist ärztlicher Rat erforderlich, Verpackung oder Kennzeichnungs- etikett bereithalten. Darf nicht in die Hände von Kindern gelangen. Augenschutz/Gesichtsschutz tragen. Nach Gebrauch Hände gründlich waschen. BEI KONTAKT MIT DEN AUGEN: Einige Minuten lang behutsam mit Wasser spülen. Vorhandene Kontaktlinsen nach Möglichkeit entfernen. Weiterspülen. Bei anhaltender Augenreizung: Ärztlichen Rat einholen/ärztliche Hilfe hinzuziehen.